If you have dry, dehydrated and dull skin then you MUST try Skin18 sheet masks. There has not been a single sheet mask that disappointed me! Before heading to my hometown for Diwali, I used Mirum Fresh Fruit Honey Real Nature Sheet Mask* that kept my skin hydrated and bright for a good one week! Mirum Fresh Fruit Honey Real Nature Sheet Mask costs $1.80/ Rs 120 approx and guess what, it is currently on discount for $1.25/ Rs 80 approx! You can BUY ONLINE on Skin18 website! If only you know korean language! Mirum Fresh Fruit Honey Real Nature Sheet Mask is made from natural cotton crosel mask which is made from 100% natural cotton. The cotton sheet mask allows essence and other ingredients to get absorbed into the skin completely! Mirum Fresh Fruit Honey Real Nature Sheet Mask provides hydration and nutrition to the skin. It gives a healthy glow to the skin by providing all necessary nutrition! 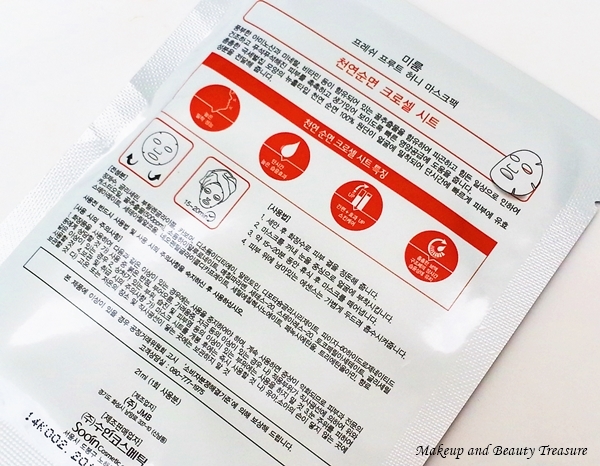 The packaging of the sheet mask is easy to tear and you do not need any tool to open it! The mask is made from 100% natural cotton sheet mask that is completely soaked in essence! I find the sheet mask a bit large for my face so I had to adjust it a bit to cover up my face properly! The scent is very mild and reminds me of sweet honey! After cleansing my face, I simply apply the sheet mask on my face, lay down and relax! I remove the sheet mask after 15 minutes and massage the essence onto my face! It makes my face soft, hydrated and healthy. It gives a bright look to my skin! It does not contain comedogenic ingredients so it is safe for acne prone skin as well! - Sweet honey scent which is very mild! - The sheet mask is nicely soaked in essence! It is not dripping wet! - Instantly hydrates the skin! - The glow is visible for a week! - The size of the sheet mask is a bit large! 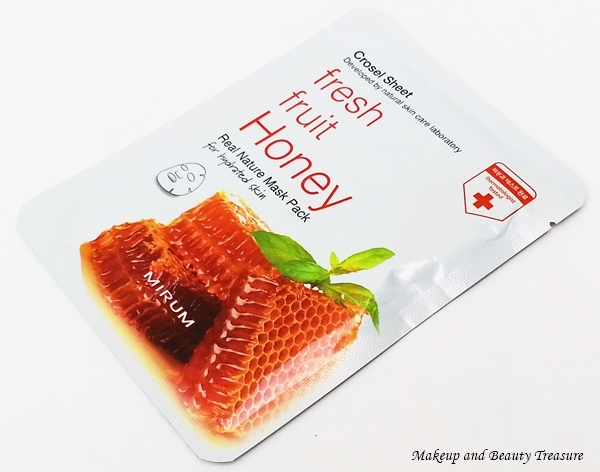 Mirum Fresh Fruit Honey Real Nature Sheet Mask is a good option when your skin feels dry, dehydrated and lacks glow. It instantly hydrates my skin, giving a beautiful glow to it. It suits all skin types and I would highly recommend it to everyone! - Apply sheet mask after cleansing your face! - Do not wash off your face after using sheet masks! - Throw away the sheet mask after using! - Use the remaining essence from the package on your elbows, hands and knees! What do you do to bring brightness to your skin? I love sheet masks and this seems worth trying...will try out soon! Same here. Do try it out. Its very good! Hi Megha, sheet masks of Skin18 are very good!I love this shop! I agree Chiara! they instantly brighten up the skin! I have used this mask, and loved this mask alot,.. I have a honey mask from a different brand, I am yet to try it. honey masks are great to hydrate skin!